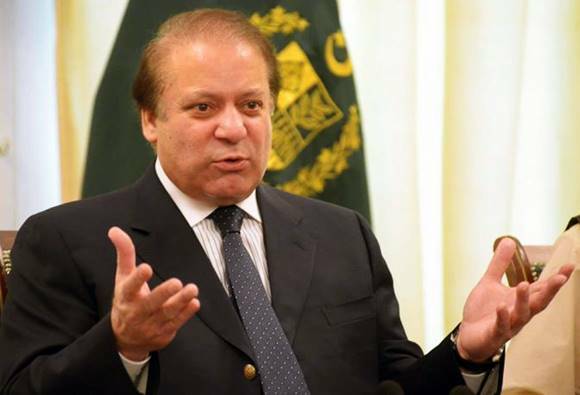 Prime Minister Muhammad Nawaz Sharif, Thursday (today) terming Kashmir an unfinished agenda of subcontinent’s partition said that Pakistan would never abandon Kashmiris in their freedom struggle. “The world in general and India in particular should know that Pakistani nation would never abandon their Kashmiri brethren and would continue to support them in their just and UN-mandated freedom struggle, the prime minister said while chairing a meeting on the incident of firing at passenger bus by Indian security forces near Neelum valley. The prime minister said that Pakistan had exercised maximum restraint despite the continuing ceasefire violations by Indian security forces along Line of Control (LoC). He urged the international community to take note of deliberate targeting of civilians and said the intentional targeting of innocent civilians particularly children and women, ambulances and civilian transport could not be tolerated. The prime minister emphasised that international community needed to play its active role in diffusing deteriorating security situation along the LoC. The prime minister was briefed by Advisor to PM on Foreign Affairs Sartaj Aziz, DG ISI Lt.Gen. Rizwan Akhtar, Special Assistant on Foreign Affairs Tariq Fatemi and National Security Advisor Lt.Gen. (retd) Nasser Khan Janjua on the prevailing situation along LoC particularly after the unprovoked ceasefire violations on November 23 by the Indian occupation forces in Dhudnial sector. The meeting reiterated its condemnation of the bus massacre and re-affirmed its political, diplomatic and moral support to the people of Indian Occupied Jammu and Kashmir in their just and legitimate struggle for their right to self-determination in accordance with the UNSC resolutions. The meeting paid rich tributes to the jawans of the country’s armed forces who laid down their lives yesterday while defending their motherland. The meeting deplored the belligerent targeting of the ambulance which was rescuing the victims of the bus attack, as a blatant violation of International Humanitarian Law. The meeting agreed that India was deliberately trying to divert the attention of the international community from the grave human rights violations, massacres and atrocities being committed by the Indian security forces against the innocent and defenceless Kashmiris in Indian Occupied Jammu and Kashmir. Foreign Secretary Aizaz Ahmed Chaudhry and other senior government officials also attended the meeting. Why this sudden spring in his feet? Please watchout when he has such upsurge in his statements? Brutus does not forgive.